Our Guided Day Trips out are a unique way to explore the local area, take in some beautiful scenery and meet some of the local wildlife! 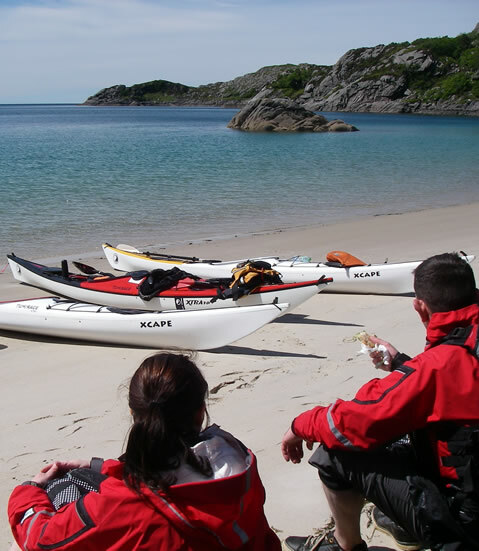 Our Guided Day Trips are for people with any level of kayaking experience. Unless you book as a private group we will fit you into a group. Most of our clients who come out on day trips are beginners but we always do our best to try and fit people into a group of similar ability. If you are a more advanced paddler you might be better suited to one of our higher level courses. We start the day at 9:30 at Glenuig Inn and select a suitable venue dependent on the ability of the group and the weather conditions. We are lucky to have lots of beautiful sheltered areas nearby to explore. When we first get on the water we spend a bit of time helping you to get to grips with how to control the boat and use the equipment. When you feel confident, we then head out for a journey to explore the beaches, islands and secluded bays in our local area. We would always encourage you to come out with us for the full day rather than a half day if you have the time. This allows for a much more relaxed experience where we have more time to ensure you are happy and in control before heading out for a journey. It also gives you the opportunity to stop off for lunch in your own secluded spot. We have Guided day Trips running most days through the summer so get in touch now to book!